The Security and Defence Agenda organised an evening debate on ‘Lessons learnt from the Gulf of Aden operations’, with speakers Robert G. Bell (US Mission to NATO), Rear Admiral Giorgio Lazio (NATO Maritime Command), Anja Shortland (King’s College London) and Koen Vervaeke (EEAS). The SDA’s Giles Merritt moderated the discussion which revolved around the continued need to tackle piracy in the Gulf of Aden, the efforts already undertaken by the international community and the reasons why piracy has not been completely erased. 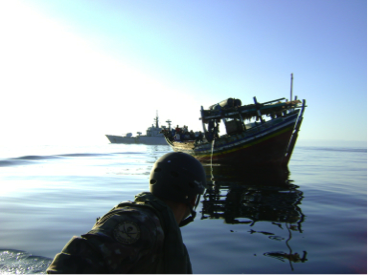 International naval operations by EU, NATO and the Combined Task Force 151 in the Gulf of Aden, in combination with the efforts from the navies of countries, such as Russia, China, India, Japan and Saudi Arabia, have been successful in reducing the number of piracy incidents from hundreds to handful. This reduction in numbers has made the discussion about the renewal of NATO and EU operations mandates relevant. These organisations must now decide whether it is time to pack up and go home, or if the expense of staying can be continued to be justified. It can be argued that the operations, in addition to deterring piracy, are a valuable training method for the navies as well as an unique opportunity to cooperate with countries such as China and Russia. NATO decided that their presence continues to be relevant and renewed Operation Ocean Shield’s mandate in early May for further two years. The mandate for the EU NAVFOR Atalanta is also up for renewal this year and the EU has to decide if the benefits from its operation outweigh the costs. In his introductory statement, Robert Bell outlined five key points for the past and continued success of the operations: 1) on-board protection that the shipping industry was convinced to invest in; 2) the role of naval combatants has been significant and they have been able to respond to attacks, especially within the International Recommended Transit Corridor (IRTC); 3) a comprehensive response is required to address the root causes and to introduce rule of law solutions; 4) multiple actors are welcome when they act in a complementary manner; and 5) money matters, meaning that the activities have to be optimized to produce maximum value for money. However, money is less of an issue when there are close to 200 attacks in comparison to when there are only two. Rear Admiral Lazio underscored the success in the cooperation between the operations and different navies and offered SHADE as an example of this. SHADE was created as a response to the lack of unity of command and it is a new paradigm resulting in unity of effect and it demonstrates how some issues are more easily resolved at the operational than at the political level. NATO’s decision to extend the mandate by two years is based on the fact that the pirates are not gone completely; they are involved in other illegal activities, such as smuggling, due to their piracy activities being prevented. Unfortunately, the shipping industry has responded to the reduced attacks by lowering defences, using shortcuts and lower cruising speeds, which all make ships more vulnerable to attacks and might end up facilitating piracy. The situation in West Africa differs from the Gulf of Aden in a few key areas. In the Gulf of Aden there are no local institutions capable of fighting piracy and the presence of the international community is needed, whereas in the Gulf of Guinea the institutions are present and the international involvement is required for capacity-building. The piracy in the Gulf of Guinea is not the main problem, in fact it can be seen as one of the business models among other illegal activities. Anja Shortland used AIDS as an analogy for piracy in the Gulf of Aden: the underlying problem still remains, even though the symptoms are not visible. The Somali Government has no real influence in the regions of Central Somalia or North Puntland, where the piracy problem stems from. In these regions, the local elites guarantee the security of pirates in the absence other means of income. For now piracy has been suppressed, but the infrastructure has not been dismantled and the further international presence is still required. Action must be taken also on the ground, with the enforcement of rule of law and the engagement of local elites being especially important. The business model in Somalia’s piracy is to keep hostages on board and the key input required is community protection. If the community refuses to provide this protection from rival groups as well as the declining right of anchorage, it is much more difficult for the pirates to continue their activities. For pirates it is enough to reach five per cent success rate for their activities to be profitable and it is likely that the few attacks that have taken place this year have been cost-effectiveness tests. The EU and other international actors have been hugely successful in tackling piracy in the Gulf of Aden and Koen Vervaeke argued that the EU should expand its activities also to the Gulf of Guinea. The EU’s lessons learnt from fighting Somali piracy are the following: the understanding that the piracy is only the tip of the iceberg, with smuggling, trafficking, and illegal fishing among other satellite illegal activities; the awareness that there is no legal framework to tackle this broad range of criminal activities; and the recognition that the EU’s comprehensive approach by combining military, legal, developmental and capacity-building instruments with political and diplomatic efforts have been key to success. The ability to address root causes is important and the lack of legislation related to piracy continues to be a significant difficulty. When piracy emerged as an issue in the early 2000s, a UN report outlined that the illegal fishing by foreign vessels and the dumping of toxic waste off the coast of Somalia are the main factors contributing to piracy. It is however arguable whether they really are the main causes, but neither can be efficiently tackled as long as Somalia has no exclusive economic zone and there is no centralisation of licences for fishing and waste disposal. As in many areas linked to piracy, capacity-building is required to combat these issues. Nevertheless, illegal fishing is a poor excuse to attack tankers and in the end it is not the fishermen who are behind the attacks, even though they may be hired by organised crime elements. From the developmental perspective, a part of the reason that piracy persists is the remoteness of the area from other economic activity. Somalia also lacks the institutions, such as the coast guard, that are needed to fight the piracy effectively. In Puntland there has been an attempt to establish a coast guard, but it was pointed out during the debate that sometimes it is difficult to distinguish between the Puntland coast guard and pirates, which has led to the reluctance by the international actors to work with the Puntland authorities. The EU’s missions in the region, EUTM and EUCAP Nestor, are looking into training authorities in coastal surveillance as well as developing other capabilities. The Operation Atalanta has done a lot for the idea of EU military cooperation. The operation at the Gulf of Aden has demonstrated how future EU involvement in Africa can function and how development and security should go hand-in-hand to produce results. A real long-term solution for piracy is to develop the ability of local actors to take care of the issue themselves. Technical solutions, such as specific ships or drones, can only help to address the issue not solve it. Piracy will remain a challenge and it is important to sustain current efforts so that the already achieved gains will not be lost. This entry was posted on 21/05/2014 by ISIS Europe in Conferences, Contributors, Saara Ilmonen and tagged EU AVFOR, EUCAP, EUTM, Gulf of aden, NATO, north puntland, piracy, Somalia, the security and defense agenda.